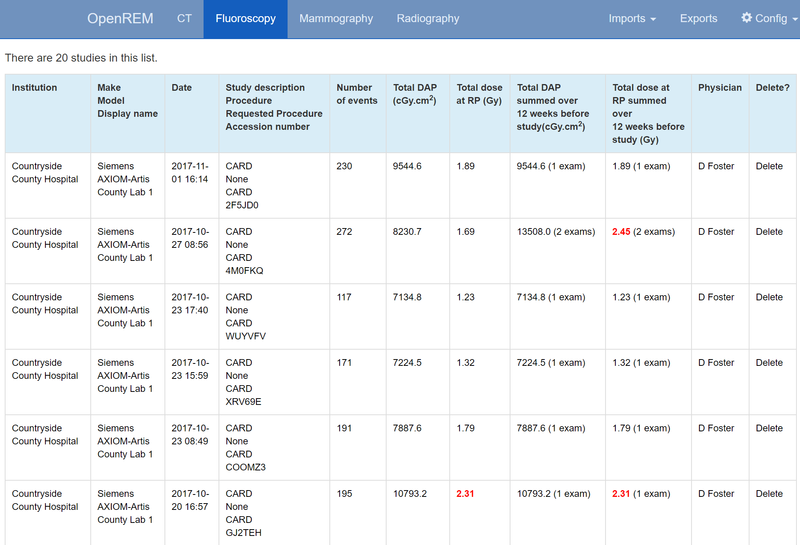 The system highlights fluoroscopy studies that have exceeded defined levels of DAP and total dose at reference point. These alert levels can be configured by an OpenREM administrator via the Fluoro alert levels option in the Config menu (figure 1). The default alert levels are 20000 cGy.cm2 DAP and 2 Gy total dose at reference point (figure 2). Figures 3 and 4 illustrate how studies that exceed an alert level are highlighted in the filtered and detailed fluoroscopy views. 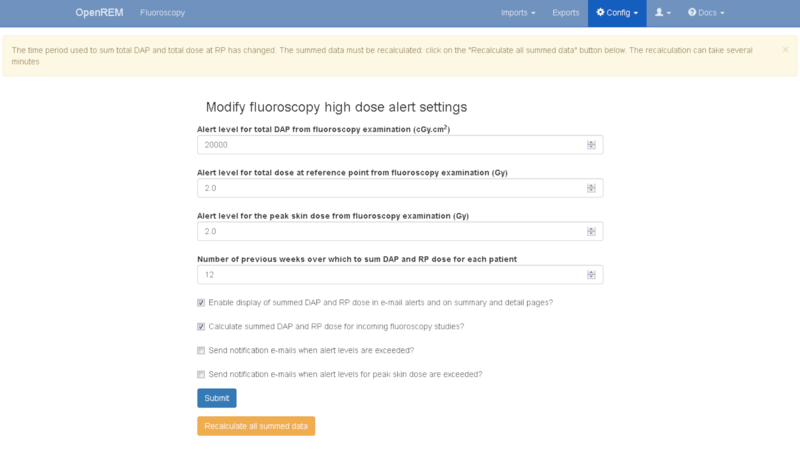 As well as alerting to individual studies that exceed alert levels the system can be configured to calculate cumulative dose over a defined number of weeks for studies with matching patient IDs. 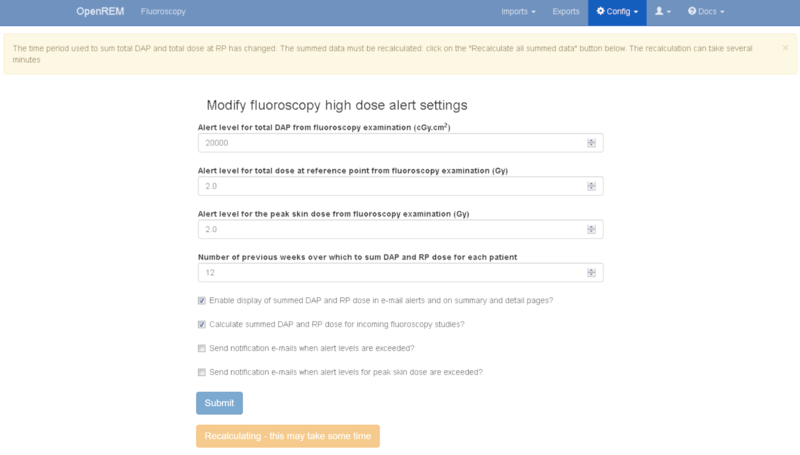 When this is activated, for each study OpenREM looks for earlier fluoroscopy studies that have taken place that share the same patient ID, or encrypted patient ID, and sums the study DAP and total dose at reference point values. The time period that is used is configured by an OpenREM administrator, and defaults to 12 weeks (figure 2). For this feature to work the storage of patient ID or encrypted patient ID must be enabled (see the Patient identifiable data documentation). 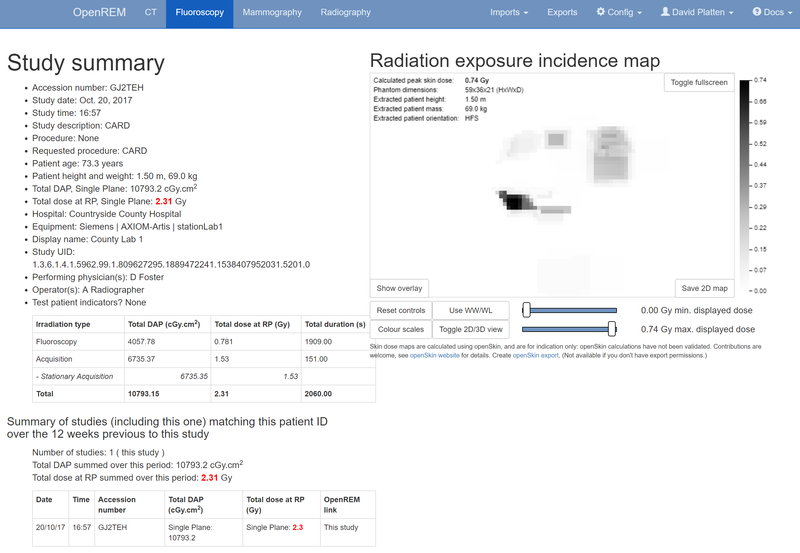 An example of a study where there is another study with matching patient ID is shown below in figure 5. In this example neither of the two individual studies had doses that exceeded an alert level, but when summed together the total dose at RP does exceed the corresponding alert. 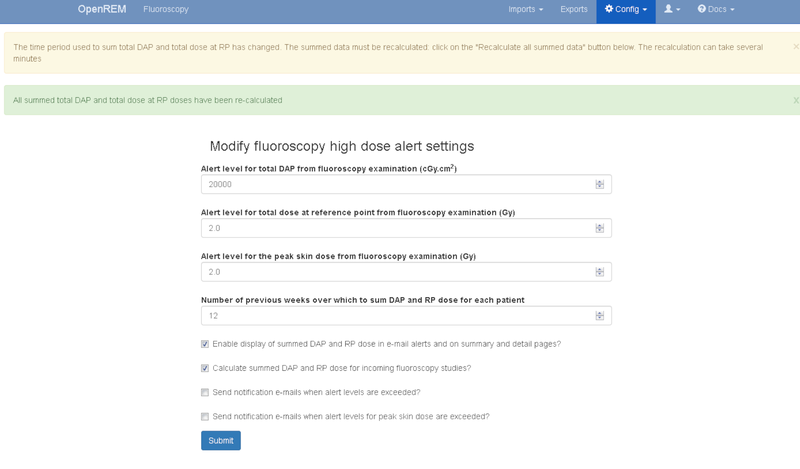 After upgrading from a version of OpenREM prior to 0.8.2, or after changing the alert levels or number of weeks to look for matching data, the summed dose values must be recalculated. The user is prompted to do this via the display of an orange button, as shown in figure 6 below. If settings have changed an information message is also displayed at the top of the screen. Recalculation of the summed data is likely to take several minutes. During this time the form buttons are faded out and disabled, and a spinning icon is shown in the middle of the page (figure 7). The user must remain on this page until the calculations are complete. Once all summed data has been recalculated the orange recalculate button is hidden, the other form buttons are reactivated and the user is shown a success message at the top of the screen (figure 8, below). For this feature to function the e-mail section in local_settings.py must be correctly completed (see the E-mail configuration documentation) and the e-mail server must allow sending of messages that originate from the OpenREM server, or from the authenticated user specified in the e-mail settings. 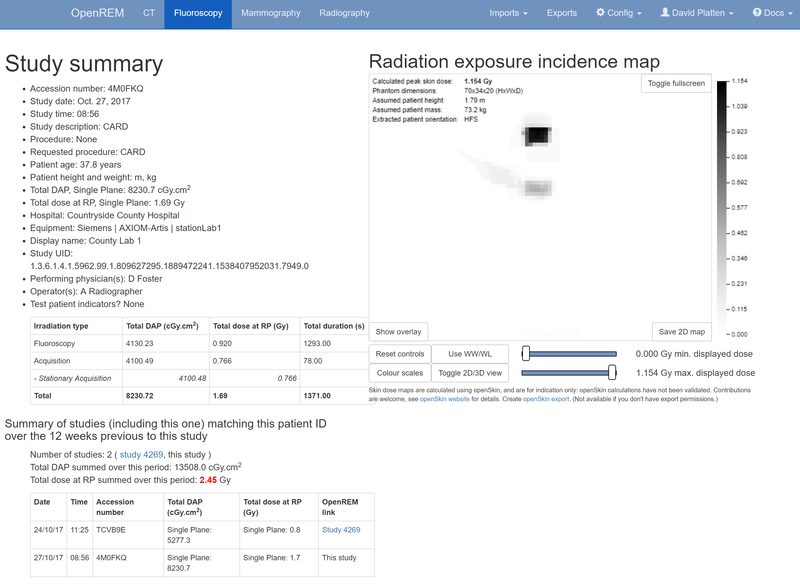 OpenREM users can be automatically sent e-mail notifications of studies that have exceeded a high dose alert level. 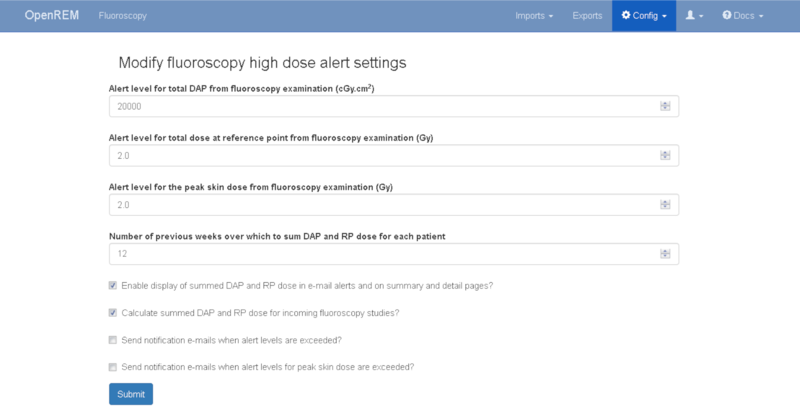 This feature can be enabled or disabled by an OpenREM administrator on the High dose alerts configuration page as shown in figure 2 above. Alert recipients users are chosen by navigating to the Fluoro alert notifcation page via the Config menu. Figure 9 shows an example of the notification page. It should be noted that any OpenREM user selected to receive high dose alerts must have an e-mail address entered in their user profile.